It is a drop event with a Water bonus. Complete the map to have a chance for a castle to drop. If they do not drop, the next completion has a higher chance of dropping. Difficulty does not affect drop rates or rarities as far as we know. Only the event map itself affects the drop rarity. The easier maps (E-1, E-2) are much less likely to drop the ☆4 units, and the harder maps (E-3+) almost only ever drop ☆4. 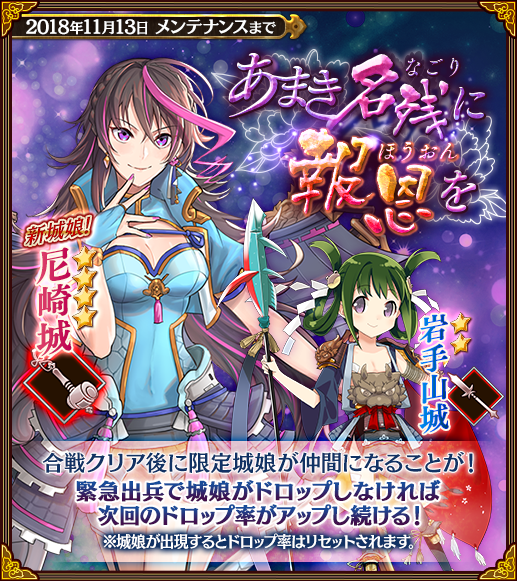 As a note, E-X1 and E-X2 drop 3 and 4 jinmusume from their warehouses respectively, so they are a good place to level one girl while farming. 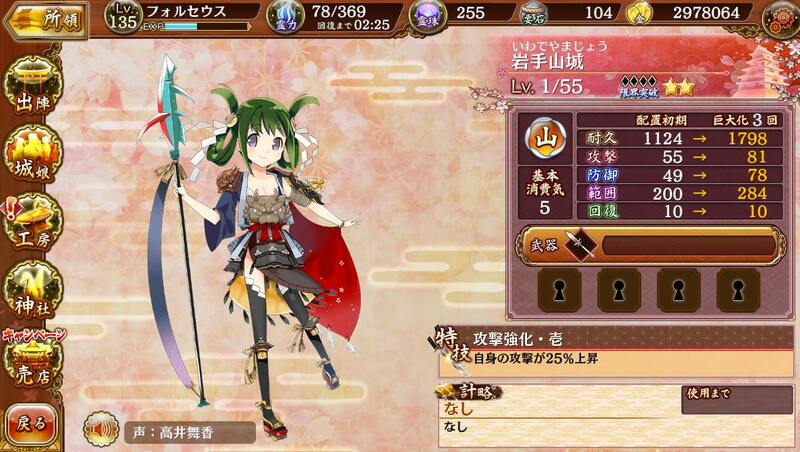 Komakiyama-jou and Iwadeyama-jou each have their skills active. 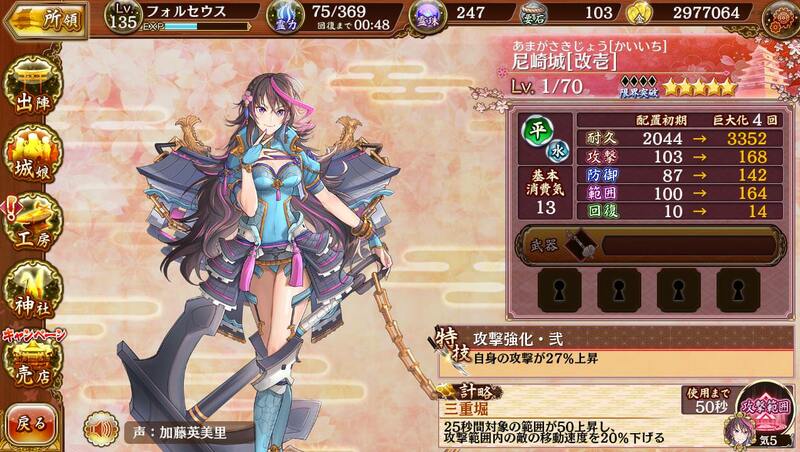 Komakiyama-jou increases her own Range by 30, and increases ASPD by 17% for all enemies in range. 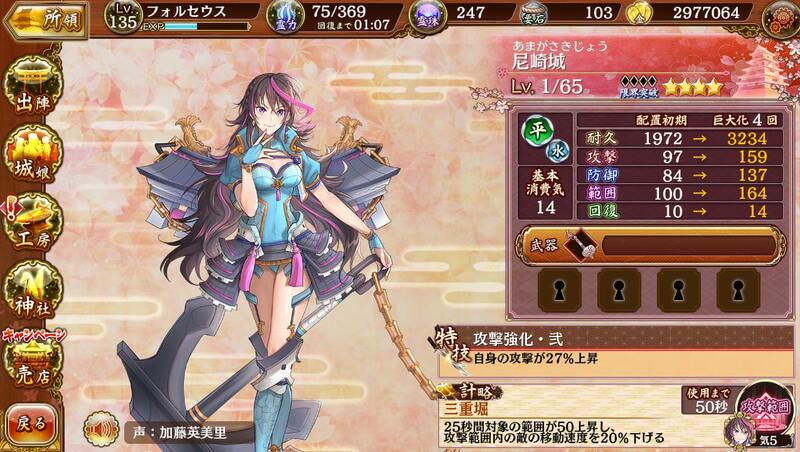 Iwadeyama-jou increases her own ATK by 25%. The new Moose-type kabuto affects other Animal-type kabuto, and each moose on the field will increase DEF by 100. Furthermore, as their HP decreases, their own DEF increases. 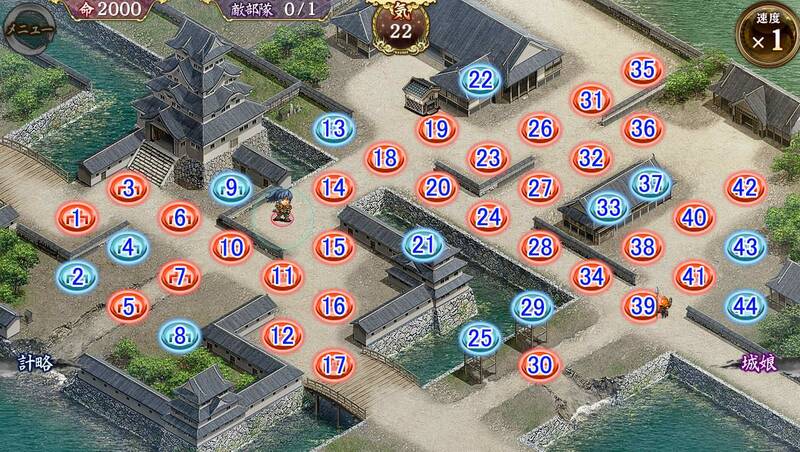 Water map means it's good for Usuki. She can set up at 19 and cover most of the area or be defensive at 31 with her token at 35. 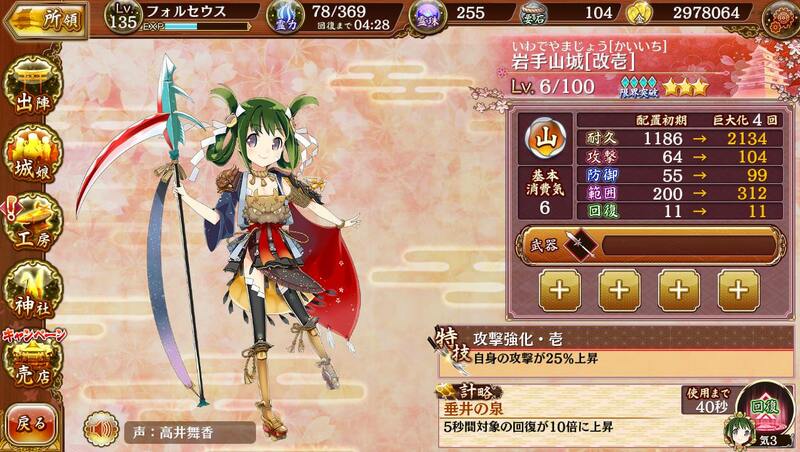 Her token can be at 23 if she's forward, and a gun or bow with a few upgrades can protect it at 27. You can start the round by chipping the moose at 2 and 6 and then retreating when it gets out of range and the snakes crawl in. You'll want to defend melee at 17/18/22 at the least to protect the warehouses. 31 and 43 are good spots for Talismans and Staves to slow down/kill the moose and if they're good enough, you won't need a melee at 22. The moose are very strong so it's difficult to tank against them. A strong enough magic at 31 can also stop whatever comes from the north from killing Tono but you might need a melee nearby or another ranged at 35. Blocking on the upper path can become difficult if you don't have enough DPS. The spears with the black ball arrow shields will draw a lot of fire and are very tanky. If you don't have enough damage, they'll just stick to a blocker and the rest of the enemies will walk through. A melee at 18 can help clear these enemies, and Shikano or Kasugayama work well for this while being generators. On the bottom lane, you probably want a melee at 40 as well. It's safe from the moose, but it can range the 37-32 area so she can pick off the deer, and when the cavalry rushes through, she can help slow them down for the magic before they can reach Tono. Bodaisan's flags decrease ATK and DEF by 20% for all castles in range. Multiple flags do not stack. 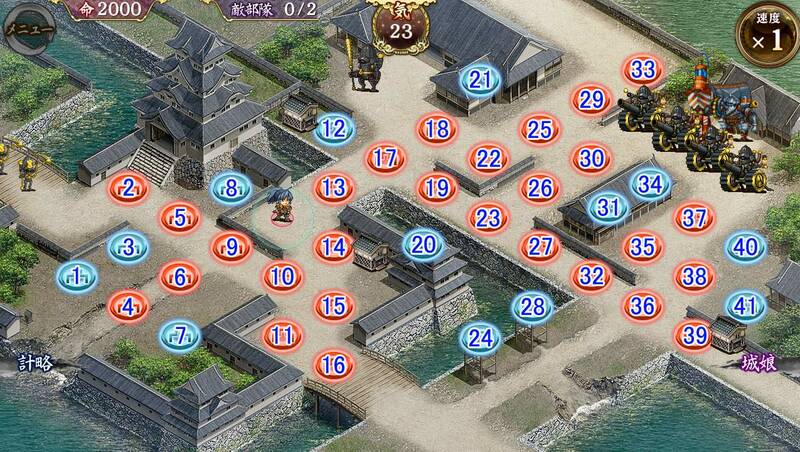 Flag Kabuto increase HP and ATK by 50% for all enemies by being on the map. 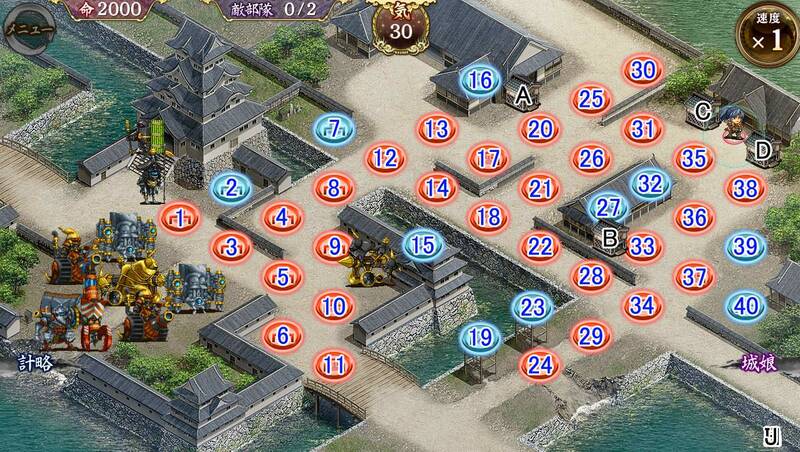 There's a lot of annoying AOE, high defense, and strong hitters from the enemies on this map. Round 1 has two elephants that move 3-7-9-13-8-12-16-20-23-27. Round 2 features a lot of big clubs going at A, and more clubs the same route as the elephants. There's also the sword kabuto that stop on their target and keep attacking until they're dead at 30-25-31, and 7-9-14-10-15. Iwadeyama attacks A as well, but is the easiest castle to take out. 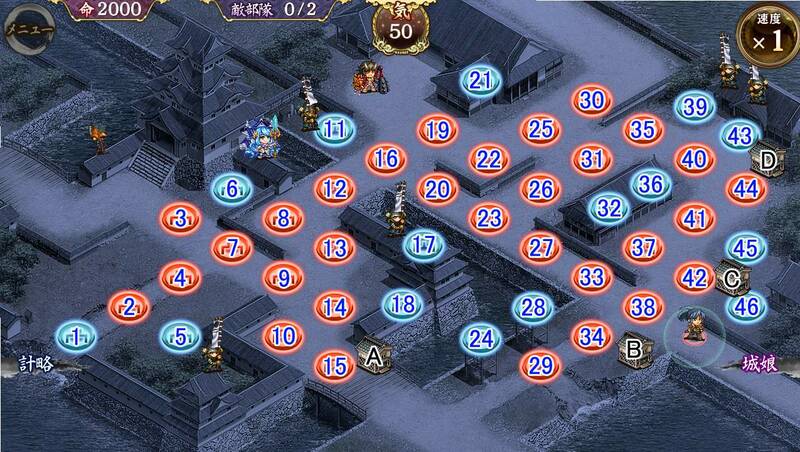 Another elephant attacks A this same route, and another at 30-25-31, and then Oniga later attacks this side too. Airships circle around the middle a bit and go 12-13-18-24-29-B. Amagasaki attacks A at the end. I recommend blocking at 9 late in Round 2. You can't block at 14 or 10 because the splash will destroy A unless you have a barrier stratagem to save it. I also recommend a Bow at 18 to shoot down the airship, and possibly additional blocking at either 31 or 25. 17 is a good spot for a Bell. Blocking at 31 means the hammer splash will hit 26/32/35/36 so you'll have to support at 39/43. Blocking at 25 is a lot more forward but you can support more easily with 32/36. If you want to kill all the flags, you'll need damage stratagems because there are two on the top left that are out of range of any attackers, unless you do something cheesy like use Kiyosu to convert a tile and have a really forward ranged unit. Last edited by Folseus; 12-31-2018 at 04:07 AM.